West Ham will announce a record net profit as high as £25m in nine days time via the financial accounts are published at Companies House but remains cash poor. The Hammers earned TV money worth nearly £122m last season, up £35m from the last accounts thanks to the new Sky/BT TV deal. That applied to all PL clubs last year. London Stadium ticket sales will add another promised £10m to the record turnover meaning turnover could reach around £187m for the 2016/2017 season. That’s an increase of £45m from the £142m recorded by West Ham for the 2015/2016 season. Total wages including players are likely to have reached 50% of turnover at around £93.5m and based on last year’s figures we can also expect another £30m in external administrative expenses/outgoings which include the £2.5m for rental of the London Stadium plus another £9.5m in agent fees. Despite all of that the club remains relatively cash poor. Last year they were forced to again borrow money from Media Rights and Funding mortgaged against their training ground, shop leases and London Stadium lease. This annual loan is akin to an overdraft to inject cash flow into the club. The Irons have made a number of cash payments up front last year but in the financial accounts, these are depreciated these over a number of years. The £15m handed to the London Stadium owners is spread over 99 years in the accounts (£15,000 per year). The £11m for the shop and ‘WestHamification’ of the London Stadium is spread over 10 years (£1.1m per year) while players are often paid for 50% up front but spread over the life of their contract as an asset in the financial accounts which can be up to five years. Doubtless the usual cries of “foul” and questions asked as to “where has the money gone?” will arise when the accounts are published. However, although the board will inevitably receive criticism as is par for the course CandH understands they took a reduced interest rate of four per cent on their outstanding shareholder loans in the last financial year. So moving to the track hasn’t improved anything ! Without the tv money were feked ! Which means nothing is going g to change and they are going to rely on Moyes to get them out of the 💩! They clearly are the wrong people to take us forward ! Nothing has and never will change my view of these amature chancers !!!. That’s exactly the right point laz ..moving has not made one bit of difference they kept saying if we move we can buy quality p!layers and can compete with the biug boys but it was all a lie IMO..the accounts are what they want us to see But 100% it’s not all of it ..they would never show their full hand .. If they make £25m profit, I would like to see it reinvested into the team or failing that paid off the clubs debt, it is not healthy to hold onto close to £100m pound of a debt reducing it by 25% would be huge for the future, in reality if they ran the club properly we should be able to get that down to zero within 10 seasons, they argue they could make more money by reinvesting the finance associated to their loans so they should start paying it off, in 2020 when they take their deferred payments at 4% it will be sizeable for the club irrespective of what they say. I will be personally surprised if the profit isn’t greater than £25m I think also the £38m for UP goes in this time doesn’t it ? The £25m figure is net profit after player trading and other expenses the gross profit figure is much higher. As for spending it, it is already spent. Like I said they spent £15m to the LLDC and £11m to refurb the shop and stadium. £26m paid up front but only £1,115,000 on the books so the £25m went on the Stadium but will be depreciated over a number of years. You just stated the £15m is paid on the never over 99 years so what is it they £15k a year or they lumped the £15m up front? Cheers Sean, will look forward to your updated piece when you get the official numbers. Why don’t they convert some of their loans to equity – like many other owners of football clubs, instead of taking money out of the club via interest! Because they own 86% already Tripp Smith owns 10% and Brown and Harris family the remaining 4%. Why would Smith, Brown or Harris give up equity? Unless you are suggesting diluting the stock which means Smith, Brown and Harris see their percentage reduce. The devil is always in the detail with company accounts, so lets wait until they are published, although you’ve obviously had some sort of preview. Your focus on cash is the right thing, however the board clearly had many opportunities to address the ‘cash poor’ situation you describe. For example: instead of paying off 3rd party debt and replacing it with directors loans, why not add to the debt – with the increased turnover, it could be afforded and does the billionaire David Sullivan really need the interest? ; why pay for all the things you list up front? 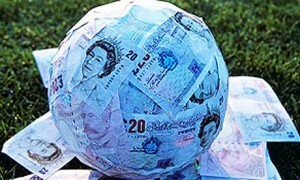 ; where is the cash from the Upton Park Sale? ; Net transfer fees are falling? I suspect we’ll see a set of accounts that doesn’t look like a business investing to move onto the ‘next level’. Hard to disagree with that TW. Boleyn Ground sold for £38m which will be listed accounts but not as turnover. Interesting point on borrowing more, I guess they will say they are trying to build a sustainable business which does not require any external capital. The real question is whether that can be achieved and move us to the next level? I think most fans will take the view that the commitment was made to take the club to the next level, but it hasn’t been backed up with actions that look anything like that. You build a business through investment and taking calculated risks. We seem to have taken risk out of the club and made little investment, apart from that in the initial turn around that David Gold keeps reminding us of. It was a very dependable jock strap as jock straps go. Let me just point out that If I and my mate/business associate were worth close to £1bn combined and were genuine, lifelong West Ham Supporters; I would be too ashamed not to pay off the club debt by injecting £100m into the club from my own wealth and even more ashamed to actually take on the debt via loans and pay myself interest!. It’s not as if they are going to leave themselves or their families short is it now? Either do the right thing and inject some of their own wealth into the club (without wanting the money back plus interest) or, stop lying to the fans by claiming that they love the club so much and admit that it’s all about a “bit of business”..
DS’s wealth of £1.1bn is mainly property and West Ham itself, £200m of that the valuation of his West Ham shares. Most multi-millionaires are not cash rich, when DS needs cash he sells a building. When Gold needed money to loan the club he took it out of his investment fund/pension. They try to make their money work for them so the truth is they can get better returns from other investments rather than investing in a football club which has a poor return in general. A reasonable property based empire might generate a 5% yield, which on £1.5bill is ‘only’ £75mill pa. If you were a serious billionaire supporter, you might ‘only’ put half of this into your football passion (and struggle to spend the rest), which given that transfer costs are normally spread over 3 seasons, would ‘only’ enable us to spend £100mill net, in the summer. Hmmm, you appear to know quite a lot about our owners wealth, assets and financial dealings, how interesting! If that is the case however, still doesn’t explain why Mr Sullivan for instance cannot realize say £200m of his assets to pump into his lifelong obsession leaving him to struggle on with just £900m to live on. Perhaps though, Soviet style clothing is more expensive than I thought. If I had total assets of say £50k I fully accept that putting 20% or so of my total into an obsession is foolish, but if I had £1.1bn it would be a no brainer. Pretty sure most real West Ham fans would feel the same. I don’t claim to be a business expert, but my take on it is that the owners over estimated the importance of an increased stadium size. The TV revenue has become the major revenue stream. This has not closed the gap between us & the big shots but it has pretty much removed the advantage we might have got over those of ‘the rest’ who have small grounds but still get the massive TV money. I guess this was just an honest business mistake. Should they have been able in 2010 to predict the big jump in TV money? I don’t know. But I do think it scuppers the ‘next level’ dreams for the immediate future. Whether a club manages to secure a safe top half place i.e. between 7th -10th or spends each season scraping around the bottom half will depend on really good recruitment, having a top class academy & on good team management. Not as exciting as it all seemed back in 2010 but there you go. Such is life.. The thing that irks me more than how cash poor the club is, why haven’t this board been able to attract some serious investment during their stewardship? If you consider the number of clubs that have had huge financial injections that were no way a more attractive proposition than us, with everything we’ve got going for us, fan base, stadia, history etc. It beggars belief as to where it has lead us to! I can see how someone who doesnt understand business might spin it that they are taking money out of the club but in actual fact the owners are saving the club a fortune by lending their own money to the club at only 4% interest. They could get a much higher interest return on their money if they invested it elsewhere. The club also don’t pay tax on loans and interest payments but the board do pay taxes on the income. If the board took all of their money out to earn a higher rate of income elsewhere then West Ham would have to borrow at a rate a lot higher than 4%. Isn’t the point that it’s only ‘a few million pounds’ of interest payments, but a billionaire supporter just doesn’t need it. Any owner who’s serious about growing a business AND understands that it’s already at least quadrupled in value since he bought it would be putting more money in not taking it out. Unless of course he was really focused on a sale? Nice of the Club to leak the results once again Sean, no doubt in a bid to try and lessen the outcry when they are finally published! The main problem, as I see it, is the increased TV revenues, went into player acquisitions (transfer fees and agents fees) and contracts without significantly improving the quality and size of the squad. Sullivan also handed out new contracts left, right and centre – Ogbonna, Obiang, Reid, Antonio x 2, not to mention silly wages for Fonte, Snodgrass, Ayew and Arnautovic. And yes the Club is cash poor and needs a significant injection of working capital, but that won’t come from Sullivan and Gold. If I was as big a fan as they claim to be, I don’t think I would charge any interest on my loans to the club. If ,as is claimed, they have to charge said interest, there must be methods to give such interest back in some way or other. They don’t have to charge interest! Owners at Chelsea, Everton and Bournemouth have all made interest-free loans to their clubs. How many PL clubs aren’t on the hook to the tv money? If Sky walk away half the clubs would fold within a couple of years. It’s very easy to spend someone else’s money. Until we can start signing shirt sponsorship deals for £200m over 5yrs we won’t be able to catch up with the top teams.